I’ve just taken a fancy to write a relatively pointless and highly uninformed post. Meaning, I read a ponderable, I decided I wanted to ponder it, and I decided I wanted to have an opinion on the matter, even though I’m highly unqualified to do so. It’s Saturday, a day for relaxing, and as an introverted feeler, thinking about things that make me feel good is, well, relaxing and makes me feel good. I also like to think in details and it is fun just to think of a thing from different angles, considering a variety of possibly relevant details. It makes me happy to think about things I know nothing about and think of questions that might be relevant to learning about the topic, if I so decided, or, If It Tickled My Fancy, which leads me to the point of the post. Chuck Grantham, in talking about something that didn’t tickle his fancy, wondered out loud “where the fancy is located on the human body”. 1. What is the opposite of a fancy being tickled? Of not taking a fancy to do something? 2. What part of my body feels what when something tickles my fancy and I want to do it (which made me think about the connection between ones fancy being tickled and motivation. How are the two similar, how are they different? Is a fancy being tickled a subset of the bigger issue of motivation. 3. Is there a difference, perhaps, in the fancy-tickler location between thinkers and feelers? Or is the possibility of doing something because it tickles ones fancy absurd to thinkers, say, as opposed to feelers (I ask that, because I know some thinkers who cringe at the possibility that I would do much of anything based solely on it tickling my fancy. Yet, we all, I must believe, do that, in different ways and to different degrees. 4. What is the difference between a decision we make because it tickles our fancy and because we reason out that we need to or want to do something (which ties into my previous number–is doing something because it tickles our fancy more of an emotional thing, tied into emotional centers of the brain vs. reasoning centers? or is “the Fancy” something that is somehow related to both sides of the brain, and can both (a) be tickled by either emotions or reasoning and (b) motivate emotional or reasoned activity. 5. 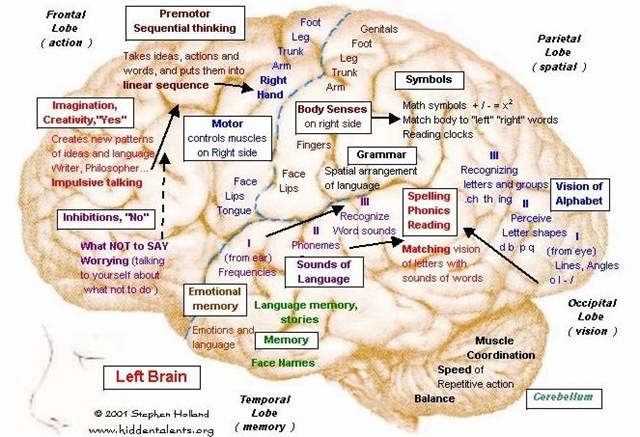 Hmmm, the majority of these ponderings are focusing on the brain rather than the rest of the body for locating the fancy. I suppose it could be someplace else (which is why I was thinking about where I FEEL whatever it is I feel in my body, when my fancy is tickled. So, is the fancy someplace in the body that can be tickled or tripped by some brain activity in a particular region or regions? Or is it actually a place in the brain. The answer, I have no idea. 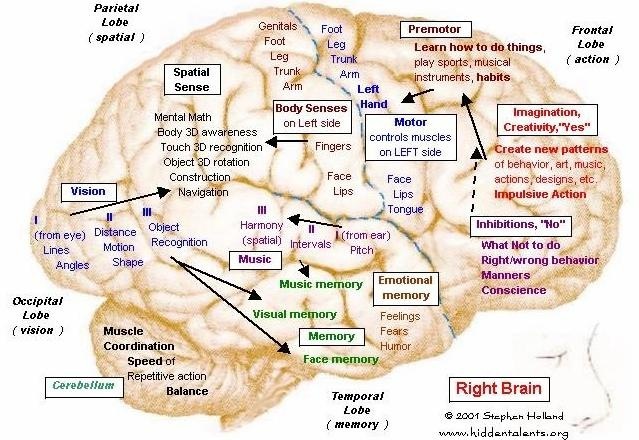 But it tickled my fancy to think about it, and I enjoyed looking up brain maps as I pondered the question. I couldn’t even make much sense of most of the brain maps. I found these particular images, with words I actually understood, but I’m still a bit confused about what does what where in the brain, because parts of the two images overlap, and because for every thing I think I understand, I have more questions (which shouldn’t be hard to imagine, if Chuck’s simple comment, in just a few minutes drug me relentlessly through all those questions above). Still, given as I’m just speculating here, I’m going to take a tentative guess and say whatever that part of the brain is that they’ve labeled, “Imagination, Creativity, Yes”, is where the fancy might be found. If it’s the part of the brain where I’m thinking perhaps possibility meets creativity meets motivation meets decision making and everything lines up so that I go, “Oh, yes, I think I’d like to do/try that”, then that seems pretty close to me to what I picture the fancy being. I just love the brain! I don’t come close to understanding much of anything that goes on in there, but it sure is one fascinating array of beautiful complexity! To get the technicalities out of the way, the quote is from Evening is the Whole Day, by Preeta Samarasan, and she is quoting Graham Swift in Waterland. I don’t think I’ve completely sorted out all the complexities of that quote, which is no surprise, because I often enjoy reading things that I only understand 15 to 25 percent of. It stretches my brain, it makes me think, it makes me think outside my own natural box and ponder things from different perspectives, and sometimes it makes me think of things that weren’t exactly the point of the quote. In this case, the quote served as a trigger to my previous thoughts on regret. My life has taken some pretty rough turns and gone down paths that I’d rather not have gone down. But I end up a bit baffled sometimes because it seems like people expect me to have more regrets than I do. I find that often there is a tendency for people to want to analyze every single decision and find “the thing” that they (or I) did wrong which could have prevented the outcome that happened. There is a sense in which the regret that comes from that seems to be therapeutic. If I can find something to regret, I can place guilt (or perhaps shame) someplace/anyplace and make some sense of what happened, and maybe over assure myself that I won’t let THAT happen again. I don’t know for sure. I think those are a couple of the functions and benefits of regret. Perhaps you can think of some more? As a disclaimer before I get where I’m going with this, when I talk about not really giving much space to regret, I’m not against looking at cause and effect and making connections. We learn that way. We run by the pool, slip on the slippery surface and back up in our minds and come to the conclusion that we could have likely avoided that skinned knee by being a bit more careful on a slippery surface. A lot of wisdom is gained by looking carefully and reflecting on the past, and then learning from it. But, if we make regret carry more certainty that it should, I believe we make a grave error. I was thinking that regret is often to the past what fantasy is to the future. A big picture imagining that becomes realer than real. The problem about regret is not what it does know–I did this and this happened–but the confident assumptions and assertions of what it doesn’t know–if I’d have done this other thing, things would have been much better. But regret, unlike what really did happen, (and like fantasy) is created in an ideal, imagined world. The alternative possibility(ies) that make up regret, were they lived out, though, would have been lived out, not in that ideal imagined world, but in just as complicated, complex and often messed up world as the original action/choice. That kind of thinking feels very similar to the fantastic thinking of fantasies: Things would be absolutely wonderful and certainly infinitely better than they are now, if only THIS were true. It’s just not realistic. And neither, I’m thinking are regrets the way I mostly hear them used. Give me grief and sadness and when I really see that I have certainly blown something, repentance. Regret, though, does not feel productive, in that it purports to know with certainty what can’t be known and longs for the changing of a past in ways that can’t be changed. Regret doesn’t even seem to honestly accept or reflect reality. “The useless Ifs of history…” I’m all for learning from my past. I’m not for trying to reinvent it. I’d rather allow the past to be what it is. Remembering the past accurately is important to me. It is what it is. It’s what has made me who and what I am today–all of me the good, the bad, the traumatized, the confident, the strengths, the weaknesses. To try to imagine, with the help of regret, how things could have been different, immediately begins a hugely impossible task. There are too many variables too complexly intertwined with each other to say with certainty “If I had done this differently” or “If so and so had done that differently” X would have happened. I am not even convinced we can say with certainty, “If…. then Y would NOT have happened.” All we can say with certainty is X happened. And grieve it or rejoice in it, or, usually, some difficult combination. What I know is, This is what happened. This is Who I am. There is a lot of happiness and there is a lot of grief in the past. It most certainly continues to affect me and shape who I am, but I cannot live in the past, trying to make it more palatable or rework it like a video game where I get a second chance to make it work out differently. I can live in the present, remembering and making space for the past–the good, the bad, the ugly. But I cannot live in the past, and usually I think that is what Regret does. What are your thoughts? As definitive as I sound, I’m still thinking through these things and open to the possibility that I’m making more of the semantics of “regret” than is really there. Ann Patchett has some interesting thoughts in a little book called “What Now?” which was originally a graduation speech she gave at Sarah Lawrence College. I always appreciate a fun metaphor, and that one made me smile. I don’t know that that actually reflects my experience with education. I found that, regardless of what I specifically remembered from college, it changed me just hearing it and considering it. So, there is a sense in which the impact was immediate, rather than something which came to full fruition later. But, in any case, the metaphor the author gives lays a nice groundwork for what she talks about next. She is referring to her 12 years at an all girls’ Catholic school. At the time, I thought that mine was the most ridiculous, antiquated secondary education in the history….I learned modesty, humility and how to make a decent white sauce. The white sauce I probably could have done without, but it turns out that modesty and humility mean a lot when you’re down on your luck. Ann Patchett ended up waitressing for a long time between her graduation and actually beginning her successful career as a writer. At college and at writer’s school, her “specialness” had been emphasized. I’m not knocking being special, it was nice to hear, but when it was clear that I was just like everybody else, I was glad to have had some experience with anonymity to fall back on. The nuns were not much on extolling the virtues of leadership. In fact, we were taught to follow. Taught to follow. Is that taught very often? Does it seem hideous to even think about such a thing? In a world that is flooded with children’s leadership camps and grown-up leadership seminars and bestselling books on leadership, I count myself as fortunate to have been taught a thing or two about following. Like leading, it is a skill, and unlike leading, it’s one that you’ll actually get to use on a daily basis. It is senseless to think that at every moment of our lives we should all be the team captain, the class president, the general, the CEO, and yet so often this is what we’re being prepared for. No matter how many great ideas you might have about salad preparation or the reorganization of time cards, waitressing is not a leadership position…. You learn to be helpful and you learn to ask for help. Ah, these words feel like a drink of refreshing water to me. It turns out that most positions in life, even the big ones, aren’t really so much about leadership. Being successful, and certainly being happy, comes from honing your skills in working with other people. For the most part we travel in groups–you’re ahead of somebody for a while, then somebody’s ahead of you, a lot of people are beside you all the way. It’s what the nuns had always taught us: sing together, eat together, pray together. These words made my brain go in at least two different directions: thinking about the surprising and unexpected ways that education affects us, and the whole concept of learning the skill of following. I’d love to hear your thoughts on these quotes. Are you naturally a leader or a follower? Have you found yourself in positions that require the opposite of your natural bent? And, if so, what kind of things have you found helpful for training you, either in leading or following? It was just very nice to me to think about developing the skill of following. That feels like a whole lot less pressure to me than to try to figure out how to be the leader that I’ll never naturally be. Part of it, I think, is that we equate being a leader with influence. But, I think followers can be people of great and positive influence, too. eclexia on Prayer for the World–The Elderly in the U.S.
Joy on Prayer for the World–The Elderly in the U.S.